Learn about the botany of Salvia Divinorum. You can even grow one in your home. Salvia Divinorum is widely available and a ticket for a trip inside your mind. 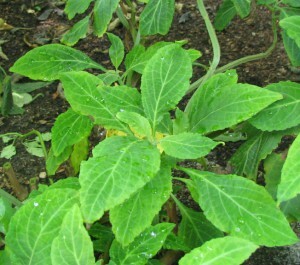 The magical, mind altering effects of the Salvia Divinorum plant is really something special. Welcome to Salvia.net, a site dedicated to a plant variously named Salvia divinorum, Ska Pastora, Diviner’s Mint, Sally-D and Lady Salvia. Though its psychoactive properties have been known to the Mexican Mazatec Indians for ages, it was relatively recent that the plant drew the attention of Western ethnobotanists, and even more recent (the early 90’s) that its active component, salvinorin A, was isolated. Salvinorin A turned out to be the strongest natural hallucinogen known to man. In recent years salvia has become increasingly popular amongst explorers of alternative states of consciousness. Because salvia enjoyed a legal status for years, researchers had the opportunity to study the mechanisms of its effects and possible therapeutic applications. This website keeps you up to date on current research being conducted and its legal status around the world. Salvia.net also informs you about salvia’s history, its chemistry, how to grow the plant yourself, how to use salvia safely and effectively and invites you to share your personal experiences with this extraordinary hallucinogen. The effects of salvia are overwhelming, especially when smoked. Because of this, one must carefully prepare oneself for the experience and have at least a general idea of what to expect. We invite you to browse this site before embarking on your salvia journey and hope it helps your first experience to be pleasant and meaningful. A young team of anthropologists and film makers led by Roberto López Mélinchon are working on a new ethnographic documentary, simply titled ‘Divinorum’.